Imports birthdays and other dates from Address Book to iCal. Is there a better alternative to BirthdayScannerX? Is BirthdayScannerX really the best app in Personal Info Managers category? 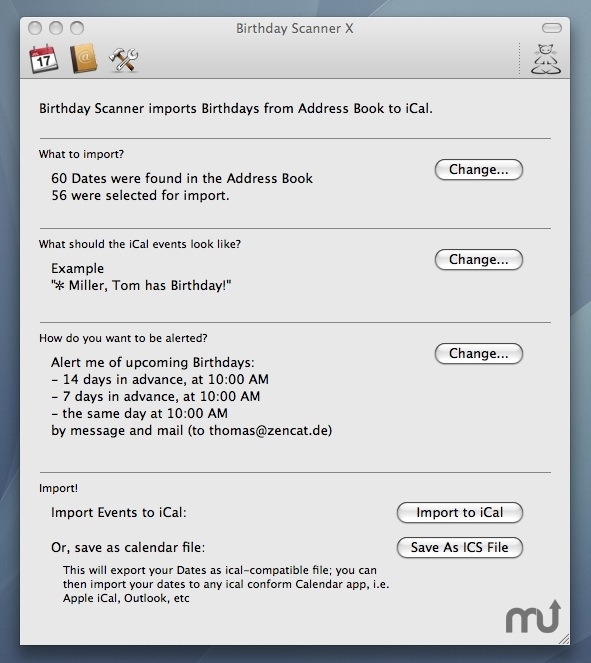 Will BirthdayScannerX work good on macOS 10.13.4? BirthdayScannerX is a powerful tool to synchronize birthdays and other anniversaries between your Address Book and iCal (or other calendar programs). iCal will remind you of all upcoming birthdays in time. Save the anniversaries as a standard calendar file. Import them to any calendar program - Microsoft Outlook, Mozilla Sunbird, Google calendar etc. Bring the anniversaries to your iPhone - without a special iPhone application: just by syncing normally with your Mac. Dutch localization added - many thanks to Eric van der Veldt for his work. In the event title settings, added "Birthyear" placeholder to show the birth year of the jubilee. Fixed issue which caused events added to the Notes field of an Address Book contact to be parsed incorrectly. BirthdayScannerX needs a rating. Be the first to rate this app and get the discussion started!